Which Airports Have the Most Unfair Fares? Airplane landing at Newark Airport, New Jersey, USA. Here’s a hint: It’s probably not the one you’re paying if you’re flying out of Newark, Cincinnati or Houston. As I’ve been working on my monthly magazine column, which focuses on how you can leverage market inefficiencies to your advantage, I’ve been doing some research on airlines, whose labyrinthine pricing schemes ensure that customers who aren’t prepared to exploit the pricing oddities will instead become the suckers. Seasoned travelers know a few tricks — for instance, the best time to look for bargain airfares is often on the weekend — and I’ll aim to teach you a few more in the magazine column. But perhaps the most basic strategy is to know which airports tend to be relatively cheap or relatively expensive to fly to or from. For instance, while individual fares vary significantly, the average passenger flying out of Newark Liberty Airport pays about 25 percent more than someone flying out of John F. Kennedy International for an equivalent seat on an equivalent flight. I’m certainly not the first person to tackle this subject. Lists of the cheapest or most expensive airports usually appear a couple of times a year in major newspapers and magazines. The government also publishes extensive data on commercial airfares. But some of these approaches suffer from flaws of various kinds. They may take a simple average of all fares at a given airport, for instance, which is problematic because each airport offers flights to a different mix of destinations. At LaGuardia Airport, for example, flights of over 1,500 miles are prohibited in most circumstances (that’s why you can’t find a nonstop flight from LaGuardia to Los Angeles), while Kennedy and Newark offer many long-haul flights. Conversely, the cities of the northwestern United States are relatively far apart, both from one another and from the rest of the country, so the average airfare into, say, Seattle is almost certainly going to be quite high. The question, then, is not where are the average fares highest, but where are they the most unfair. I doubt anyone would dispute that it’s fair for an airline to charge you more for traveling a longer distance, so distance is something we’ll need to control for. I’d also argue that it’s fair to charge you more for flying into or out of a smaller market where there is less demand for air travel. Fewer economies of scale are available in a place like that: the airline can run fewer profitable flights each day, so the costs of ground services like check-in and baggage handling will be spread over fewer passengers, and aircraft may be idle longer. At the same time, smaller airports tend to be served by fewer airlines, and lack of competition can lead to higher prices; that isn’t fair to the traveler. Nor is it fair if your home airport is one like Memphis, where discount airlines like Southwest have had trouble breaking in to compete with full-fare carriers, despite years of trying. What we need is an approach that distinguishes airfares that are high because of monopoly pricing from those on routes that are legitimately expensive to fly. The method that I’ve adopted to study this is a tiny bit involved — readers who are not statistically inclined may want to skip ahead to the charts of the results. The basis of the approach is data published by the Bureau of Transportation Statistics, which periodically releases a 10 percent sample of all domestic airline itineraries, including information on the fares paid. The particular files that I’m using come from the third quarter of 2010 and include data on, literally, millions of passengers. The data required some cleanup. I’ve limited the analysis to round-trip tickets in which all segments were flown in coach (economy) class — the type of flights that most of us are interested in. I also eliminated itineraries where the passenger traveled outside the contiguous 48 states, had more than one stop (not counting layovers), or had different origin and departure airports. I removed fares that the bureau marked as being implausibly expensive (given the millions of records, these may have been data-entry errors) — or which were implausibly cheap. I then ran a big regression analysis that attempts to explain airfares based on several factors. The first factor is the distance traveled — we use the distance from the origin airport to the destination as though it were a nonstop flight, whether or not there was a layover along the way (since the airline is not exactly doing the passenger a favor by routing her through, say, Baltimore on her way from Buffalo to Atlanta, increasing the number of miles flown). Second is a variable representing the demand for travel at both the origin and destination airports. Demand is assumed to be a function of the number of origin-and-departure passengers that an airport handled (not counting passengers who passed through the airport on a layover), but with a modification for average ticket prices. In other words, if the average fare at an airport was high, the model assumed that more people would have wanted to fly there but were deterred by the cost, and if the average fare was low, that some passengers would not have flown if the fares had not been such a bargain. (Specifically, it assumes unitary elasticity — a 20 percent increase in fares results in a 20 percent reduction in travel — for which there is support in the empirical literature.) There are demand variables specific to both the airport and the metropolitan area; these variables are expressed as logarithms. These two factors — distance to destination and size of market — are the ones I would propose can be fairly reflected in ticket prices. The regression analysis also accounts for three other factors that have significant effects on pricing. These are, respectively, the market share at the origin and destination airports held collectively by the five “legacy carriers” (United, American, Delta, Continental and US Air); the market share held by Southwest Airlines; and the market share held by the largest single carrier at that airport (for instance, Delta and its affiliates are responsible for about 66 percent of all traffic at Atlanta). Prices are higher the more the legacy airlines dominate an airport, but they also tend to be a bit higher where Southwest has a large share as opposed to other low-cost carriers like AirTran and JetBlue. (Southwest is cheap, but it isn’t quite as cheap as some of these up-and-coming airlines and now represents something of a middle ground.) Also, prices tend to be higher when any one airline dominates an airport, regardless of whether it is a legacy carrier or a low-cost one. These somewhat complex mechanics allow me to estimate what each airfare “should” have been assuming the airport had an average degree of competition between and among the legacy carriers, Southwest, and the other low-cost airlines. I can then compare these “should” fares to the average prices that passengers actually paid. At Newark Airport, for example, I estimate that the average fare should have been $382, given the itineraries that the passengers in the bureau sample traveled. 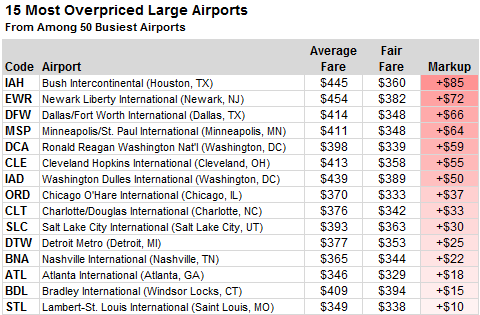 However, the average round-trip fare that those passengers actually paid was $454 — a 19 percent markup above fair prices. At LaGuardia Airport, by contrast, prices were more in line with market rates (the average ticket price was $338, as compared to a fair rate of $331). And prices were actually somewhat cheap at J.F.K. (average price $389; fair price $413). Passengers at Newark paid an average of 12 percent more than those at J.F.K. for their trips to Los Angeles, 49 percent more for those to Chicago, 65 percent more to Dallas, and 118 percent more to Washington, D.C. The main reason for the discrepancy is probably that Continental Airlines dominates Newark Airport — it currently handles 63 percent of domestic passenger traffic there, not counting the 6 percent for United Airlines, with which it is in the process of merging. No one airline dominates either LaGuardia or J.F.K. to that extent. Also, New York’s airports are somewhat inefficiently configured, with both J.F.K. and LaGuardia in the same general direction from Manhattan. Many passengers in north-central New Jersey face an unpleasant choice between commuting two hours in traffic to either J.F.K. or Philadelphia, where tickets are fairly priced, or paying the premium that the carriers in Newark are happy to extract. The table above reflects the 15 most overpriced airports from among the 50 where the most passengers begin and end their air travel. Topping the list is George Bush Intercontinental Airport in Houston, where passengers paid a premium of $85 — about 24 percent — on the average round-trip coach ticket. (Flights to Houston’s older, smaller field, William P. Hobby Airport, were only $8 overpriced). Next up was Newark. Then we see several other airports, like Minneapolis, Detroit, Cleveland, Dallas, and Washington Dulles, where one of the legacy carriers has a dominant share of traffic. O’Hare Airport in Chicago was expensive despite — or perhaps because of — two legacy carriers (American and United) having a hub there. The unifying theme is vacation destinations, like Las Vegas and pretty much anywhere in Florida. It’s important to keep in mind that the fares here reflect average prices. The legacy carriers often charge comparable fares to those of the discounters like Southwest when they have plenty of seats to fill, but when supply is short or the passenger books at the last minute, they may raise their prices several-fold. For instance, about 10 percent of economy-class round trips were sold at $750 or more by Continental, as compared to just 1 percent for Southwest. This is a more viable strategy, however, for business destinations than for leisure ones. While a casual traveler can probably forgo a weekend in Las Vegas, a last-minute client meeting in Houston may be unavoidable (plus, someone else is probably paying for the ticket). The most competitively priced destinations tended to be warm-weather cities. It’s hard to know whether this is because cities with nice weather attract a lot of price-sensitive leisure travelers, or perhaps because they entail less risk of delays and cancellations, which are as costly to the airline as to the passenger. But there were some exceptions. General Mitchell International Airport in Milwaukee, for instance, was about $75 underpriced on average, the result of a fare war among several discount carriers. Buffalo — not known as a vacation haven, although it’s close to Niagara Falls — is also a nice city for air travelers. While both Dulles and Reagan National Airports, dominated by legacy carriers, are overpriced, Baltimore/Washington International Airport, a Southwest hub, is more affordable. 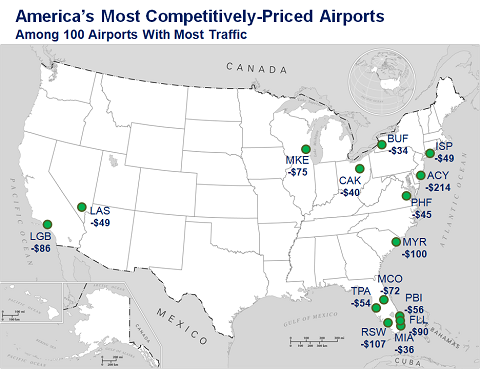 Let’s take a quick look at the data for mid-size airports — those ranked between No. 51 and No. 100 in origin-and-departure traffic. Perhaps the most unfairly priced airport in America is Northwest Arkansas Regional in Fayetteville. Economy-class round trip tickets cost an average of $527 there, $158 above fair rates. The reason, no doubt, is because the traffic there is dominated by business travelers on their way to and from the headquarters of Wal-Mart in nearby Bentonville. Although Wal-Mart is famous for its sensitivity to prices, and has saved consumers billions of dollars over the years, its pricing power evidently does not extend to the air fares its executives and clients have to cough up. Another overpriced airport is Cincinnati/Northern Kentucky International, a former Delta hub that no longer gets as much layover traffic, but where Delta still has a 75 percent market share. 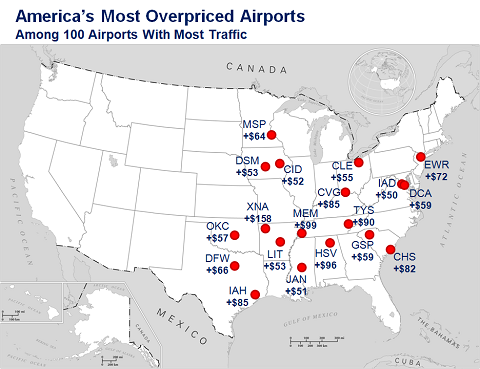 Almost every airport in this part of the country, in fact — Little Rock, Knoxville, Huntsville, Oklahoma City — is significantly overpriced. This is also the United States’s poorest region; in their own small way, expensive airfares are probably hampering the area’s economic development. 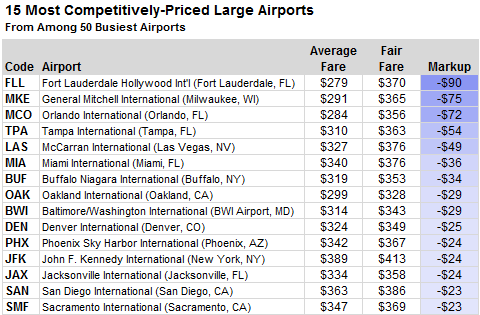 The cheapest midsize airports, meanwhile, are again those associated with leisure travel. Atlantic City, with an average round-trip fare of just $157, will leave you with plenty of money to blow at the craps table. Finally, I’ve tracked the data for all 230 airports that serve more than about 100 origin-and-departure passengers a day. If you’re flying out of an airport smaller than the top 100, you’re probably paying a premium to do so. Even accounting for the fact that these are small markets with low demand, they still tend to be overpriced, as they are usually dominated by one or two legacy carriers who will charge you a premium to fly you to their nearest hub. Passengers in areas far from large cities — like La Crosse, Wis., or Minot, N.D. — tend to be the worst affected. But even airports like the one nearest to where I grew up in Lansing, Michigan (about $117 overpriced) can go through a death spiral of sorts. Lansing is within a reasonable driving distance of Wayne County Airport outside Detroit, so relatively few people will choose to fly from Lansing unless its fares are competitive with Detroit’s. The airlines, rightly or wrongly, may take that trend to signify a lack of demand, and may cut service, with further price increases on the remaining flights. Before long, the only passengers who regularly fly out of an airport like Lansing are those who are extremely insensitive to price, creating a semi-stable equilibrium of limited but very expensive service. Still, there are bargains to be found at a handful of small airports, and those airports tend to have something in common: the legacy carriers want nothing to do with them. Among the 10 airports listed above, the legacy airlines accounted on average for just 12 percent of passenger traffic. In many cases the alternative is Allegiant Air, a small carrier that has a dominant presence in 8 of these 10 airports and which sells many tickets at what amounts to a 50 percent discount below prevailing rates. Allegiant Air, despite this, is significantly profitable, which suggests that the small-airport death spiral can be avoided. Surprisingly to no one but the legacy carriers, far more customers may be willing to use your service when you’re willing to charge them a fair price. A complete list of fares for all 230 airports can be found here; I hope you will find it handy when planning your next business or leisure trip. Note that airfares have risen since this data was collected. However, the relative fares charged to fly to or from different airports are usually quite stable in comparison with one another.